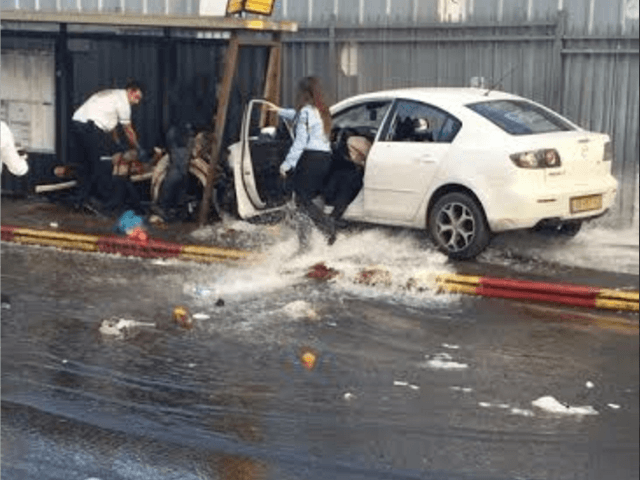 JERUSALEM (AFP) – A Palestinian attacker drove a car into Israelis at a Jerusalem bus stop on Monday (pictured) injuring eight people before being shot dead, police and rescue services said. Police later confirmed the Palestinian assailant, a 21-year-old from east Jerusalem, had died, while Israel’s medical services said none of the victims’ injuries were life-threatening. According to police, the attacker also had an axe inside the car. Images of the scene online showed a car rammed into a bus stop on the sidewalk near the western entrance to the city. Since October 1, almost daily attacks by Palestinians and clashes with Israeli soldiers have killed 117 on the Palestinian side, 17 Israelis, an American and an Eritrean. Over half the Palestinians killed have been attackers, while others have been shot dead by Israeli security forces during clashes. On Sunday, a 16-year-old Palestinian girl was shot dead after allegedly trying to carry out a stabbing attack near the Israeli settlement of Kiryat Arba in the occupied West Bank.